Michael S. Gazzaniga was born in 1939 in Los Angeles, California. He was one of five children of Dante Achilles and Alice Marie Gazzaniga. His father was a surgeon and a founder of the Ross-Loos Medical Group, the forerunner to managed care medicine in America. Gazzaniga went East to school and received his bachelor of arts from Dartmouth College in 1961. He then attended the California Institute of Technology, where he received his doctorate in psychobiology in 1964-1965. At Cal Tech he worked under the guidance of Roger Sperry, with primary responsibility for initiating human split-brain research – research that contributed to a Nobel Prize for Roger Sperry. Gazzaniga has six children, five daughters and a son. His wife Charlotte trained as a physiological psychologist and over the past 20 years has been managing editor of the Journal of Cognitive Neuroscience. After stints in various academic settings from California to New York, Gazzaniga became the Andrew W. Thompson Jr. Professor of Psychiatry and director of the Program in Cognitive Neurosciences at Dartmouth Medical School. In 1992, he became the founding director of the Center for Neuroscience at the University of California, Davis. In 1996, Gazzaniga’s alma mater, Dartmouth College, called him back to help them lead a new program in the mind sciences, where he became the David T. McLaughlin Distinguished University Professor and the director of the Center for Cognitive Neuroscience. Most recently he returned to California to become the first director of the Sage Center for the Study of the Mind at the University of California, Santa Barbara. Through his extensive work with split-brain patients, Gazzaniga has made important advances in the understanding of functional lateralization in the human brain and how the cerebral hemispheres communicate with one another. His research is known not only in the basic and clinical neurosciences, but also in a broad range of other academic fields such as philosophy, psychology, linguistics, and anthropology. Split-brain studies have revealed the complex mosaic of mental processes that participate in human cognition. And yet, even though each cerebral hemisphere has its own set of capacities (with the left hemisphere specialized for language and speech and major problem-solving capacities and the right hemisphere specialized for tasks such as facial recognition and attentional monitoring), we all have the subjective experience of feeling totally integrated. Indeed, even though many of these functions have an automatic quality to them and are carried out by the brain prior to our conscious awareness of them, our subjective belief and feeling is that we are in charge of our left hemisphere’s interpreter, a device that allows us to construct theories about the relations between perceived events, actions, feelings, and memories. Throughout his career, Gazzaniga has always seen how new methodologies could be applied to help further understanding of the human brain. He pioneered the use of magnetic resonance imaging to understand how genes influence the size and shape of the callosum in monozygotic twins. He has used event-related potentials (ERPs) to examine the distribution of perceptual, attentional and linguistic functions in the normal and brain-bisected patient. He has used functional imaging to examine lateral specialization in the normal brain. His recent work using diffusion tensor imaging has opened up new ways of thinking about how the callosum integrates information between the two half brains. It also lays the groundwork for understanding individual differences in brain anatomy that relate to specific behavioral capacities. During his years at Cornell Medical School, he launched the field of cognitive neuroscience along with his close friend and colleague at Rockefeller University, George A. Miller. Capitalizing on a seed grant from the Sloan Foundation, they established the Cognitive Neuroscience Institute, which in turn published the Journal of Cognitive Neuroscience. He then helped persuade the James S. McDonnell Foundation to invest in a significant way in the field of cognitive neuroscience. Gazzaniga founded and hosted for 20 years the Summer Institute in Cognitive Neuroscience, and served as editor in chief of the leading journal in the field, as well as the three-volume series The Cognitive Neurosciences published by MIT Press. He founded the highly successful Cognitive Neuroscience Society and has served as president of the American Psychological Society (2006) as well as the Association for the Scientific Study of Consciousness. Most recently he has been invited to deliver the Gifford Lectures in 2009 at the University of Edinburgh. Gazzaniga has trained numerous scientists during his long career. 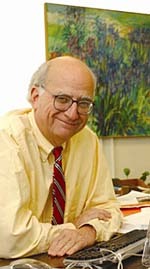 Students such as Joseph LeDoux, Richard Nakamura, and Michael Miller played fundamental roles in his career, as did his postdoctoral students such as Bruce Volpe, Kathy Baynes, Mark Tramo, Elizabeth Phelps, Jeffery Holtzman, Ron Mangun, Margaret Funnell, Paul Carballis, Matt Roser, David Turk, and many others. In 2006, the MacArthur Foundation brought together a group of neuroscientists, lawyers, philosophers, and jurists to examine the impact the field of neuroscience might have on the law. After developing a plan for studying the issues, Gazzaniga was asked to serve as director of the new national effort. In 2007, the program was launched and is based at the University of California, Santa Barbara. Gazzaniga captured the main features of his early work in his widely acclaimed 1985 book The Social Brain. His 1988 book Mind Matters served as an introduction to problems in mental disorders. In 1992 he published Nature’s Mind, which the New York Times Book Review said “might do for the mind what Stephen Hawking has done for cosmology.” In 2005, he broke new ground and published The Ethical Brain. This book has captured the vast importance of the field of neuroscience for a variety of ethical issues that range from considering the moral status of embryos to the neurobiology of making moral judgments. His new book, Human, came out in the spring 2008. Among many honors, in 2005 he was elected to the Institute of Medicine of the National Academies. * The FABBS Foundation would like to thank Dr. George R. Mangun and Dr. Daniel Schacter for nominating Dr. Gazzaniga for this honor and for leading the effort to spread the word about his nomination. Would you like to honor Dr. Gazzaniga? It’s not too late to have your name added to the list of donors! You can make your donation to Dr. Gazzaniga’s In Honor Of… campaign at anytime.